The affair officially began at 5 pm, but it was quarter-to-six before we got there. It was being held on the golf course, and our back yard abuts the golf course—but at the other end. So we drove to the clubhouse, about a mile away. The road leading to the parking lot was packed with parked cars; nevertheless, we found a space in the lot. Zachary and Tyler immediately headed for the video game truck. Michael and I immediately headed for the free hamburgers and hot dogs. We were surprised to see Zach and Tyler minutes later; apparently the lineup for the video games was moving too slowly. (Plus, they couldn't possibly have had a better setup than Zach does at home, with surround-sound, large screen HDTV, and enough games to divert even the most focused Zen monk from his meditations.) It turned out the video game truck was just the opening act. Beyond that, and beyond the hamburgers and hot dogs, spread out across the golf course, were inflatable bounce houses, a rock climbing wall, and Laser Tag. In other words, except for the hamburgers and hot dogs, not one single attraction had been invented when Michael and I were Zach's age. 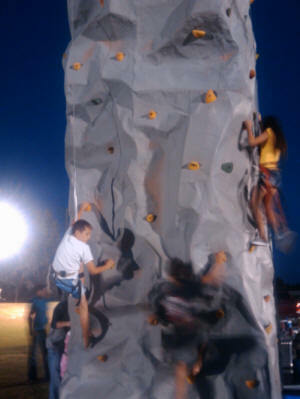 Zach and Tyler headed straight for the rock wall. Tyler was a little nervous but let the attendant rig him up with the harness that makes this a safe pastime. Zach has been doing climbing walls since he was very small. However, none of the kids seemed able to get to the top, including Zach. The handholds seemed to be positioned for adults, and, tall as he is, Zach couldn't quite reach the higher ones. He tried several times, on the theory that perhaps one approach or the other would be designed for shorter climbers. But he had to wait in line each time he wanted to try another approach. Meanwhile, Michael and I discovered that there was inadequate seating. The HOA had put up a few tables and chairs but nothing like what was required. Many people had set up blankets on a square of golf course; a few others had camp chairs. I own several, of course; but it hadn't occurred to me to bring any. The hamburger I had was pretty good. Good-quality meat, I'm saying. Michael is doing Atkins so had a couple of hamburger patties and hot dogs without the buns. There were no pies or deserts to tempt either of us. 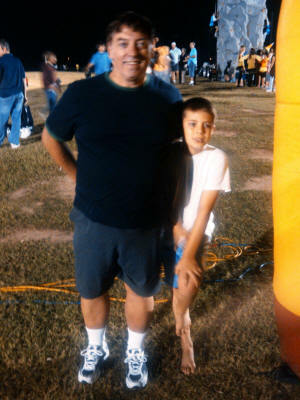 Zach and Tyler (who never stood still long enough for me to capture with my cellphone camera) then spent some time on the huge bouncy castle. I finally decided to go back home for some camp chairs, and to pick up my friend, John, who I'd invited to join us. Michael needed to get in some more studying, so he said goodnight to the boys and I took him home, picked up John and a couple of chairs and came back. It was a lot more fun for me in a chair than standing. And chatting with John, who I don't often get to see, was nice too. John pointed out that, in the inner city where he used to live, they had "block parties" that were somewhat similar to this. Except, with the Laser Tag, rock walls, video game trucks, or, with one exception, the bounce houses. Zach and Tyler spent the rest of the evening playing Laser Tag. At 9 pm the crew promptly began deflating the activities. And, by 9:10, we were returning to the house. Oddly, though I'm sure they were there, I never spotted even one of our actual, nearby, neighbors. Nevertheless, it was a very nice neighborhood party and definitely a perk of living here.